One concern I've seen lobbed our way every so often at Arcen in general is that some folks don't like the idea that we "crowdsource" our design ideas. Aka, that we listen to player feedback, really. The common way this is phrased is that we should step up and "be the designers" properly, with a singular vision that we won't compromise for anyone. That's... all well and good, I suppose. If you have a singular vision for a game, go right ahead and do that. And if it's perfect on your first try, that's amazing. But the thing is, we're not "crowdsourcing" our design ideas at all. We get feedback. It's the same thing that authors of novels do when they show their rough drafts to their spouses, to their reading group, to their test readers. They aren't trying to pander, they aren't trying to get other people to help write the book themselves, or anything like that. They want more sources of data from which to consider their creations from alternate points of view. To the specific matter at hand, the changes in TLF's combat system from the earliest RTS-like versions to the current system have all come squarely from me, in the end. Players were enjoying the RTS-like stuff in alpha, sort of, and were giving lots of feedback on things that were annoying them or that needed to be refined to make it better. There was a sense that "something is really missing here," but the feedback was all really in the vein of "how can we fill in the missing links with what is here." The old RTS-style combat model with ship deployments, from earliest alpha with player involvement and our first public video of the game. I looked at all that feedback and felt something else. Familiarity. It was getting too similar to AI War, and to solve the problems we were having here, we'd have to move increasingly in the direction of AI War. Which is all well and good -- I still love AI War -- but the battles here were supposed to be a lot shorter than that, and not always against an entrenched enemy, etc. One player in particular, I believe it was Cyborg, had noted (to paraphrase from memory) "the combat has this really different feel from the main game, where you are a little guy doing things in a wider solar system; the combat is more about clashes of equal forces." So I took a step back, and said. "Okay, we're supposed to be 'Batman in space' here, so that's clearly a problem." We were in territory that was familiar in a way that I didn't want to get into again (there's more we will do with AI War, but I don't want to try to do that in this game as well). And any solutions I thought of with the combat as an RTS would make the individual battles take longer, be more complex in terms of controls and keybinds, and in general be way more divorced from the solar map sections. 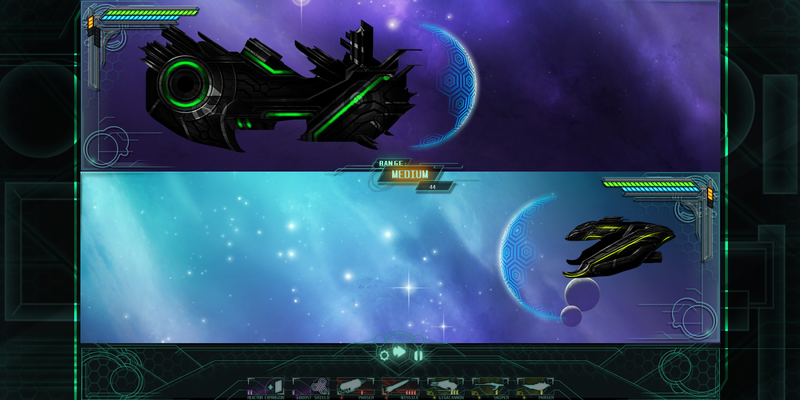 Originally this game had 1v1 ship combat from a side view, and it was more of a minigame. This was before we had any players testing it at all, it was just us. We were excited about the ideas, but eventually we ran into problems I felt were intractable, so we had shifted to the RTS model. I really loved what the RTS model had brought to the table... except I really wanted to get back to having just a single player ship. 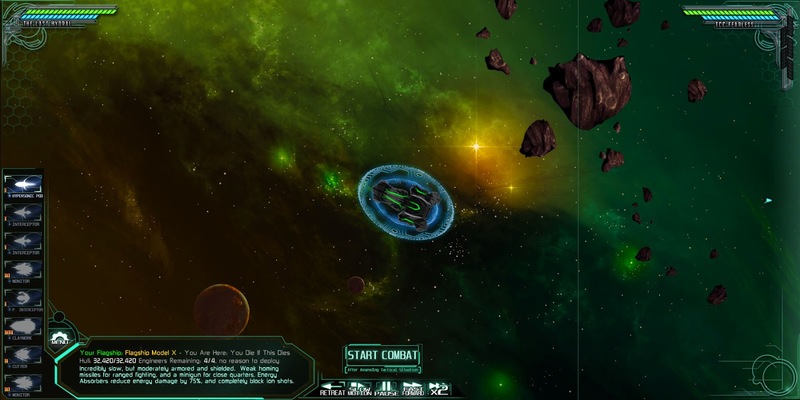 A very early prototype screen from when the game was still side-view 1v1 ship combat. This is the first time we've ever actually shown screenshots from this version of the game at all! So that's what we did! And players had also noted that they wanted to see multi-sided battles, which has been something I've always loved, too. That was one of those "why didn't I think of that?" sort of moments. So we made that a big focus, too -- again it made the combat more like the solar map in terms of the overall feel of you being the little guy caught in larger scuffles. We spent about a month working privately on this, without giving any new builds to our alpha players. I wasn't happy with it enough yet to bother getting feedback, because they would just be telling me things I already knew. If I didn't enjoy it yet, then nobody else would, either. That's one of our mantras, is that somebody on the staff has to enjoy the game or else we're really doing it wrong. Almost always, that person is me. The exceptions are when I'm not the lead designer, which has only been on Tidalis (which I did quite enjoy) and the aborted Exodus of the Machine project. 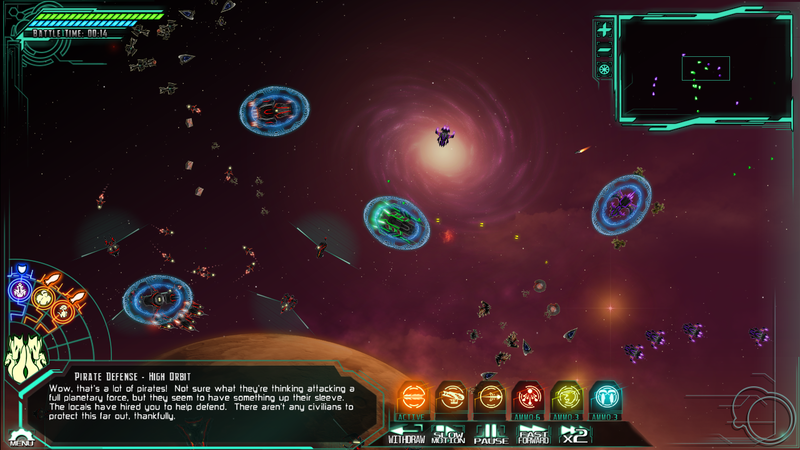 Anyway, we got the multi-faction stuff working, the combat scenarios, the single-ship stuff, etc. All of that was my design, it wasn't "crowdsourced" or even discussed with players. Though Josh Knapp (former staff member) and I did discuss it quite a lot during the first week or so, and he was instrumental at that period. But it evolved from there. We got all that working... but still it just felt "off" to me. It was doing everything that I wanted, but I found that without the need to order squadrons of ships around, there wasn't enough for me-the-player to do. I was setting courses for my ship, and watching it auto-fire, and so forth. It was... boring. The overall tactics of the battle were there, and working perfectly, but the moment-to-moment stuff was dull as dull could be. The solution quickly came to me, really -- based on our past work with things like the A Valley Without Wind games, it sprang readily to mind. I needed a gun that I could point and shoot myself. That sort of rotational shoot-anywhere gun from Valley 1 is just super fun. So we put that in, and suddenly I was having a blast. It took more balancing and tweaking, but after another week or so we finally released that version to our alpha testers (and let in a new batch of alpha testers) after a month of being incognito. This is how the combat looked around that time. We already had the special abilities in place, but note that there are only 5 of them, and none of them are equip-able weapons. So this is the point when I created the hour-long gameplay footage video of the game, which showed off not only the new combat, but also showed off the solar map stuff for the first time. Alpha players were by and large loving the new combat just as much as I was, and much happiness was had. But. There were still two issues, both of which were niggling at me personally, and also which some players picked up on and commented on. Firstly, the combat felt a bit shallow in the moment to moment bits. The tactical aspects were still there, but since you could only have one gun at a time, your solution to any incoming ship was "shoot it a lot." That is fun in a bubble-wrap-popping sort of way, but it's not something that is sustainably interesting. And it cuts out some of the moment to moment tactics. Yes you had 5 special abilities to pop off here and there, but your main gun was in general so effective (and had to be) that this was only of some real use. The solution to that did come from a player, not from me, and it was another of those head-smacking "why the heck didn't I think of that?" moments. Histidine pointed out that having only one gun, and not being able to switch guns, was limiting. Durr. In that short space of time, he was the only one to comment on it, and I didn't see it yet. I'm sure I and the other alpha testers would have figured it out before too long, but he saw it immediately. So within two days I put together a new build that had a bunch more guns, rebalanced combat around specializations, and six overall "abilities" on your bar, although 3 of them were just guns that you could switch through (reducing the former trigger-style abilities from 5 slots to 3, in other words). I put in a bunch of other things to differentiate the flagships from one another, and really beefed up the uniqueness of all the classes. This was over a weekend, and I was working alone, incognito, away from players and staff during that period. I'm not saying that to brag -- great ideas come from all sorts of sources, and often those sources are not me. But to someone who thinks that we're "crowdsourcing" our games, I feel like it's important that they actually understand what's going on. This is how you want game developers to work. You want them to listen to you, and you want them to then use their feedback to fuel their own vision, rather than just blindly following what you say, or sitting you down in a conference room to have a design-by-committee. This is a screenshot I took 5 minutes ago, of combat with the new weapon-switching at the bottom and the various other enhancements. So here we are. The combat is really fun in the moment-to-moment bits, and it's also much more mentally-involving in terms of making sure you not only use the battlefield properly, but also use the right weapons for the right enemies. You can adjust the play speed to whatever you want, so it doesn't have to be a twitch game if you need time to aim. Me, I like it fast and twitchy, and play on a more moderate difficulty level to compensate. Play as suits you. This brings us to the second problem that I mentioned (a while back) above, and which is as-yet unresolved, but next on my to-do list: identity crisis for the game. 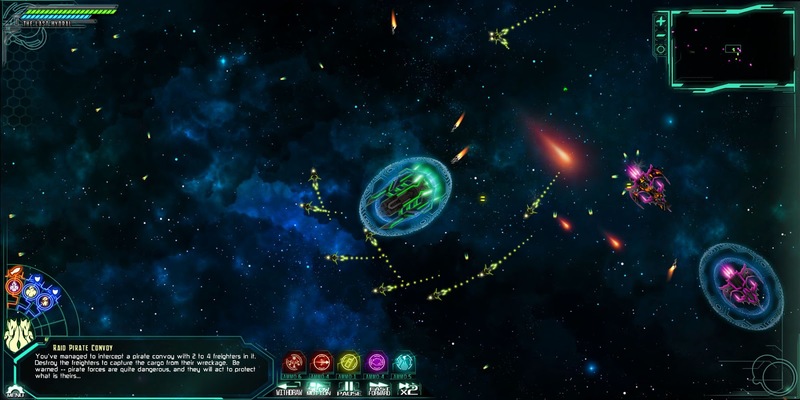 Is this a thoughtful 4X, or is this a SHMUP-like? Valley 1 and 2 both struggled with this exact same identity crisis. You could love one part and loathe the other, and that would make for a challenging time. Personally I loved both in both, but limiting our audience to the intersection of two rather disparate genres would be... well, stupid. That's a good way to go out of business. It was worrying me from the start, and players all immediately brought it up, too. In all their cases except for one (Cyborg, as it turns out), they were loving both sides, but were worried others would not. Cyborg tried to like the new combat, but just ultimately can't stand it. And I understand that -- I loved the Total War titles, for instance, but I loathed their realtime parts. So I just used auto-resolve and played it as a 4x and had a great time. For everyone else who liked the realtime parts, they were free to play that, and that's great. But it comes down to even more than that. Much as I love the action-oriented combat here in TLF, sometimes I just want to get on with it. That's another thing with Total War: by auto-resolving all the battles, I could just play one continuous, fluid strategy game. I wasn't constantly interrupted by 5 or 10 minute battles where I would then have to go "now what was I doing again?" when I finished them. If I clearly had the superior force for a battle, I also didn't just have to go through the motions, either, it's worth noting. So that's currently my thing: making an alternate combat mode that is a little more involved than your traditional Total-War-style auto-resolve, but at the same time quick and fluid and cerebral-only. In other words, keeping it a pure 4x if you use that instead of going into the action bits. And you know what? Much as I love the action bits, I plan on using that feature quite a bit myself. Sometimes I just want to get on with things, as noted above. And this way I can play the action-y combat exactly as much as I want, without ever having to weary of it. Which is important. The solar map portion of this game is a big, beautiful 4x simulation that is way more involved and interesting than anything Arcen has ever done before, in my opinion. I would hate to exclude the very type of audience that most appreciates that simply because they hate SHMUPs. And I also don't want every game I play to take me 12 hours because I'm in combat for half the time. I want to play it the way I want to play it, when I want to play it, based on how I'm feeling at that moment. That's what's coming. And that's how we listen to our players. TLF - Ending Credits Music "Lay Down Your Arms"